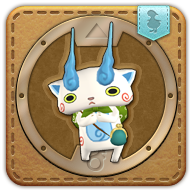 Summon your Komasan minion. He got bored with guarding his shrine. Now he wants to guard you. Komasan is a lion-dog that came from a rural area. He often expresses awe when traveling in the city. Sets a trap that, when triggered, delivers an attack with a potency of 260 to all enemies within range.